There is a key aspect to any aviator’s attire. A proper jet fighter pilot, bomber pilot, or anyone else doing anything in a plane simply needs to complement their overall style with a simple addition. That addition is the classic look of a leather bomber jacket. With an all leather body on the jacket, you instantly get a tough guy touch that will improve your style on the whole, and make you look that much cooler. Little accents on the coat such as aviation insignia and small stitching accents will differentiate this coat as a legitimate replica of the coats that stars have worn for years. 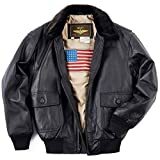 Tom Cruise helped make this style of jacket famous in Top Gun as Maverick, and you can recreate that look as well if you buy this Landing Leathers take on this classic. This particular jacket stands out as a true recreation of Cruise’s jacket with a cool fur collar and ribbed cuffs and hemming, you can look just like Tom Cruise coming back from flying his jets. If you are into the Top Gun look, you may also be interested in the sunglasses Tom Cruise wears in Top Gun. Nothing completes the tough-guy, totally in-control look of a pilot like a leather jacket and Ray Ban sunglasses that makes you look tough enough to take on any challenge in the air or land.